Fantasy Matters: Fantastically Fun Fridays: What will YOU be for Halloween? Fantastically Fun Fridays: What will YOU be for Halloween? The baby in the carrier, strapped to Jabba's chest, is definitely the best part of that commercial! It also has the potential to inspire some awesome Halloween costumes. There's always Chuck and Morgan's sandworm costume from Dune, as seen in the TV show Chuck. If you have a bigger group of friends, like in the Verizon commercial, you have a lot of possibilities for great group costumes, such as the group of friends going as Doctor Who-related characters (TARDIS included, of course). If you're looking for something a little more off the beaten path, io9 has a few less-obvious suggestions that are also sci-fi and fantasy related. 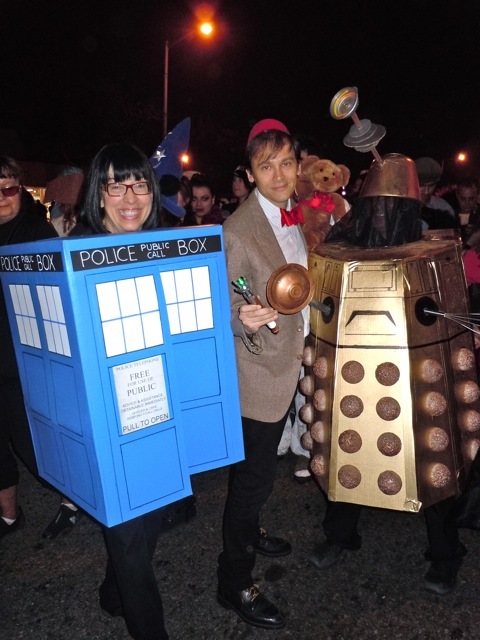 Are you creative and good at do-it-yourself costumes? Then these Storm Trooper masks made out of milk jugs might be a good project for you. And if you're looking to make a big statement, going as a sci-fi themed vehicle might be just the thing for you! Serenity, the Millennium Falcon, and the Enterprise are all great options! What will you be this Halloween? Post your fantasy and sci fi-related ideas in the comments!